Well, I sell cards and giftwrap with snazzy sea shells on, anyway, and lots of other absolutely lovely little stationery gubbins. My cards rock. 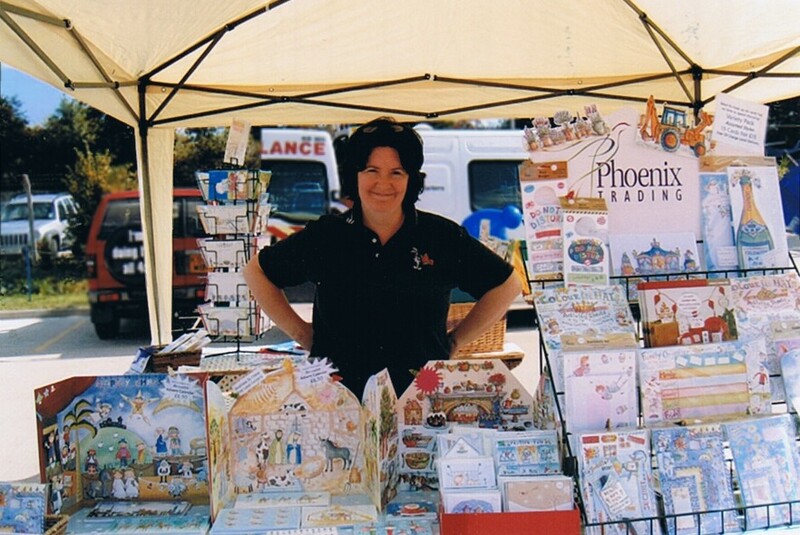 Phoenix Trading are a top-10 UK card publishing house; grown organically from tiny beginnings, the products can only be purchased direct from an independent Phoenix trader – we don’t sell through the shops. I have recently acquired my own Phoenix website which, along with field service management software, has made it easier for customers to shop online. Or, you may email me and come to my house for coffee – and maybe even a biscuit – and a browse through my stock, provided you are not a mad axe murderer. If you would like a current brochure, please do ask; it’s stuffed with lots of different items, all of which are excellent quality, all of which sport beautiful artwork, and all of which are extremely and astonishingly cheap. The cards, for instance, are all £1.20 each or £1 each for 10 or more. Being a Phoenix trader is one of the precious few jobs I know of that can be easily worked in around family and work commitments. The cards are so beautiful that they virtually sell themselves; all you have to do is ensure that people do actually look at them. (If you’re resident in the UK, Australia, France or the US and you fancy a part-time income selling really very nice things indeed, let me know. It costs a tiny £45 for a comprehensive business starter pack.) Plus, it gets me out of the house in the evenings and at weekends, which is a welcome break from the daily grind. Because I am the hick from the sticks: if you spy something you love intensely and Absolutely Have To Have, you email me cheerily and gaily send me some money – and then I have to charge you £2.50 postage. I would love to drive all the way to your front door with a beaming smile, bearing a brightly wrapped little parcel in the place of honour on my passenger seat… but unless I can get my paws on a Firebolt broomstick, I’m only going as far as the post office. If you live in the Isle of Man, The Shetlands, The Outer Hebrides, The Channel Islands, etc, etc, etc, then you know and I know that, regrettably, all postage bets are off. Now, I think it’s fairly unlikely that overseas readers would want cards from Hairy Farmer Family – I’m sure you have lovely card sellers much closer to where you’re sitting, and other Phoenix traders are active in France, the USA, Australia and New Zealand. But I wouldn’t want you to feel all upset and excluded and think that I haven’t considered you, because I totally have. Sending anywhere in the world outside Europe is potentially ridiculously cheap, considering the mileage involved – primarily because it can involve a boat, not a plane. The tiny snag is that it could take approximately a billion years to turn up. Well, up to 12 weeks, anyway. Driving it personally direct to your door would almost certainly be quicker. Failing that, there is still airmail. Overseas: Add £3.70 for a signed-for option. I would heartily recommend this. Much as I would love to go ferreting about for your lost order in a forgotten cargo-hold in Outer Mongolia, I feel that firing a compensation claim off and starting again would be so much more straightforward. Hopefully this won’t happen at all, but better to be safe than jumping furiously up and down in a teeth-grinding fury, cursing all postmen to everlasting hell and damnation. Great Britainers have lots of options! You can post me a cheque, which would be nice. You could, I suppose, send me a grubby envelope stuffed with sterling, as those types of envelopes are always gratefully received at Hairy Towers – although I cannot in conscience recommend it. Or there is Paypal’s debit/credit card service, which is quick, easy, and as secure as these things reasonably can be. The snag is that Paypal charge me a 20-50pence commission, which I will regretfully (I’m sighing. Really, I am!) be obliged to add to your – (Ann coughs in vaguely embarrassed fashion) – towering burden of cost. If you live somewhere exotic (by which I mean, not on this glorious Sceptred Isle of incessant rain) then Paypal’s International currency payments are charged at 20 pence plus 3.9%, the rapacious buggers. While I would love very much to soak up this charge myself, we are talking TINY MARGINS HERE, PEOPLE so unless I make you cough up the 20p + 3.9% too, then I shall nearly be working for the love of it. This will mean I will be forced to take a second job as a waitress 24/7, and therefore will have no time to blog or comment (or indeed, wash) ever again, so you will hear from me no more. You may encounter the essence of me if you are ever standing downwind of me, however. And… I think that is all. Do email me with any questions or with your stationery desires neatly listed complete with their codes: I am a cheerful friendly soul, particularly when anyone is trying to give me money. Hello there! Can I just clarify – could I pick a bunch of ANYTHING off the Phoenix site (love their stuff!! ), then let you know what I wanted, pay you, and you’d send them to me? It doesn’t matter whether or not you’ve got them in stock? Sounds good… watch this space… I’ll be back. Dear lady, you SHOULD write catalogue copy for a living. That was better than reading J. Peterman. Ooooh Ann, this is LOVELY! I shall be badgering Sarge about ordering some more stationery right away. (I’m sure he’ll take it gracefully after we just argued about not having the money to add another child to our house.) Really nice work, very well done you! Ooops, this is me, Flicka. Logged in as my real self. I notice when looking up advent calendars that the stock available in the U.S. is not as broad as that available in the U.K. So that’s one reason us Yanks might want to order from you! Speaking of which, what approximately would be the airmail cost of one all the way over here?